If you had asked me just three months ago how much that above French greeting would mean to me today… I would have never guessed that I would be practicing conjugating les verbes Francais, practicing les liaisons et mon accent, and be so determined to learn a new language in my mid-30s. But alas, I am!! actual notes from my French class! 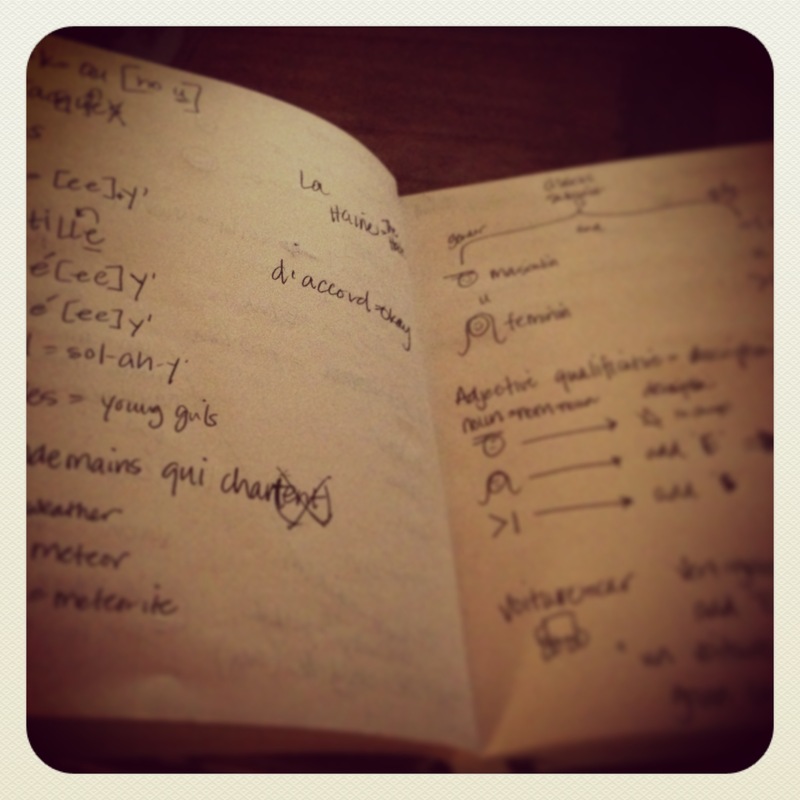 more notes from my class de la Francais! Since high school, I have kicked myself for taking a somewhat easy path with the foreign-language requirement by taking Spanish, my true first language. I justified taking the easy-A-out by saying I would learn the grammatical rules and proper form. The truth of the matter though was that I inadvertently held myself back from potentially becoming trilingual by the age of 17. Fast forward many many years, and as my Francophilia grew, so did my regret. 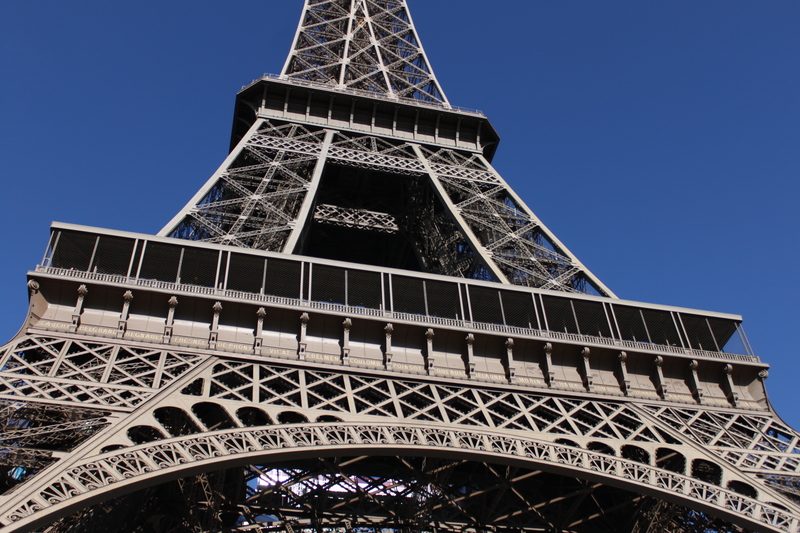 After experiencing Paris for the first time last fall, I returned home absolute and determined to learning French, even if I would only use it during my (soon to become regular) voyages à Paris. tres belle, no? oui!! 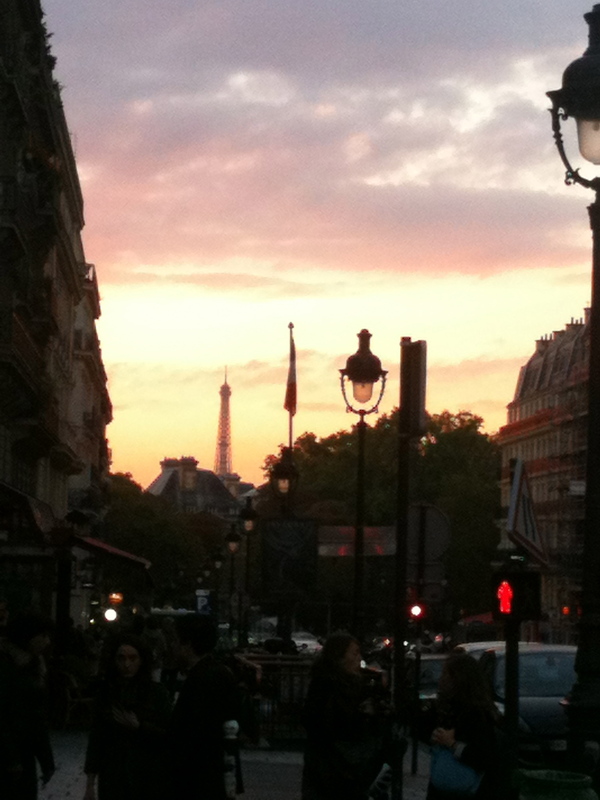 La Tour Eiffel, in all her splendor! Here in the LA area, I found a number of French classes, both private and public. I researched the Extension classes offered at local colleges, considered the very upscale Alliance Frances in Beverly Hills, and finally I found “French In Mind,” a small private school in the nearby Culver City area close to my home taught by a former native Parisian teaching classes no larger than four students total. Finding FIM and Omar, my tres fabuleaux teacher and now great personal friend, has absolutely changed my life. I look forward to my Tuesday evening classes all week, and even though I can nearly literally physically feel my brain stretching and working, not only am I on my way towards trilingualism, but the mental challenge is refreshing and invigorating. There’s nothing like learning something completely and yet partially foreign to make you feel young, but without the classroom interruptions and hormones! like a certain tagline says: JUST DO IT! Life waits for nothing and no one. Your certain something may not be what you imagine, or turn out the way you thought it would, but it could also be one of the best, most meaningful and fulfilling decisions of your life. But if you never go through with it – you will certainly never know how it could be. What have you done, small or large, that ended up being one of the best things you’ve ever done in your life? Finally, I apologize for being so absent on the blog – but I have missed you all so much! And I look forward to sharing much more with you much more regularly again. Until then, bons amies, take that risk and do that thing you’ve always wanted to do – and bonne chance à vous!! 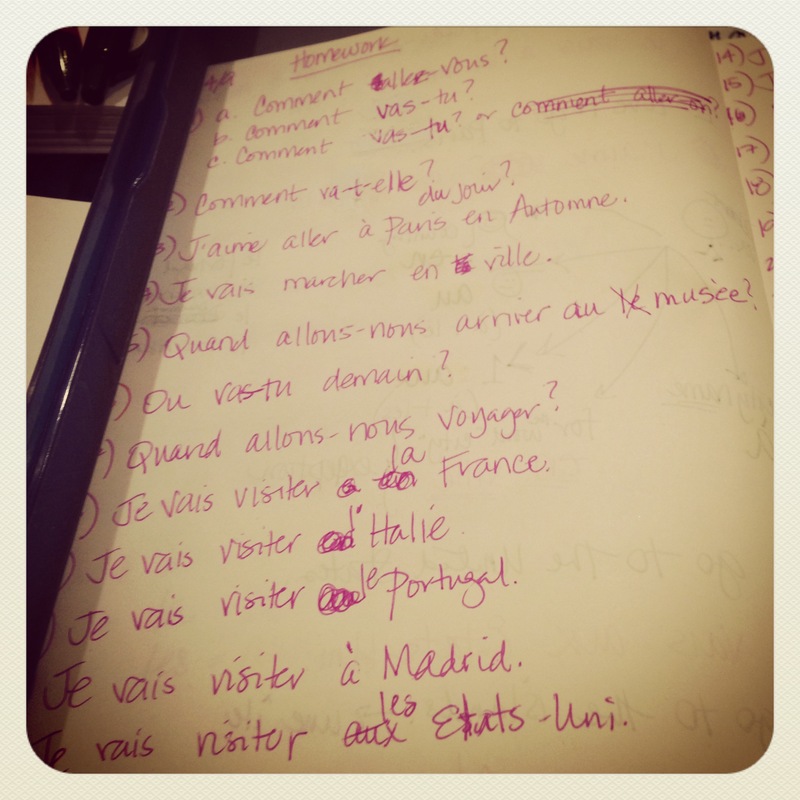 This entry was posted in belle vie, etc and tagged Class, Foreign language, France, French language, Paris by rebeccawenstrup. Bookmark the permalink.